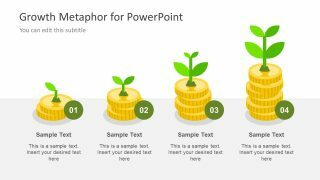 The Free Growth Metaphor Slides for PowerPoint is a business presentation for financial progress. The plant over stack of coins is a growth metaphor specifically design to illustrate project’s progress in monetary terms. It is suitable to display the business stages, life cycles, progress and also the forecasting of project’s objectives. The free template of growth metaphor contains flat vector icons and shapes relevant to finances and money. 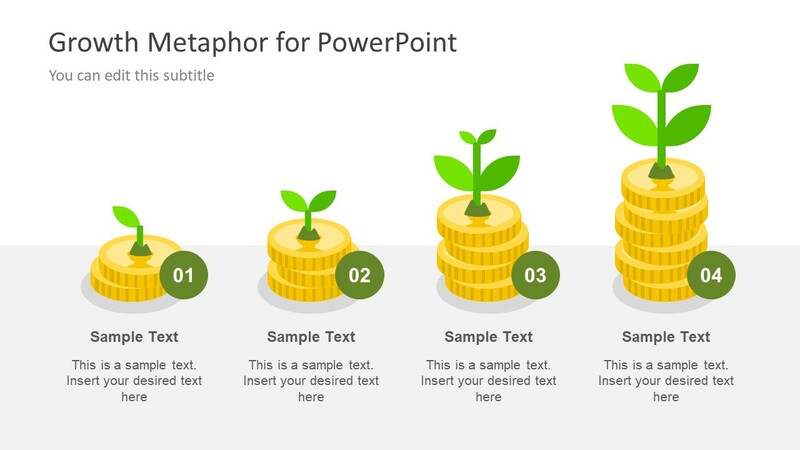 This PowerPoint of two slides contains the bar graph design illustration of stack of coins and growing plant on top. As the plan grow, the amount of coins grows as well. This design is a visual presentation of increase in business which eventually rises the market share of the company. The free PowerPoint of financial growth is usable as both bar graph and the graphical clipart to demonstrate monetary terms. 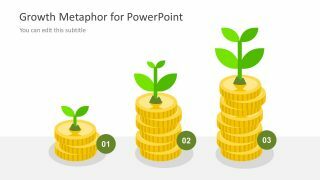 This template of Free Growth Metaphor for PowerPoint is useful for representing company’s finance milestones. Each stack of gold coins can demonstrate parodic growth in sales. These bar graphs can help the potential clients to view the current standing of company and make appropriate investment decisions. The free PowerPoint slides offer three and four bar graphs with special editing features. These editing functions for designs assist the presenter to alter colors, rescale the shapes and add effects. For instance, select a clip art and choose the desire color from shape fill pallet in drawing format menu. Similarly, make more bars of stack gold coins by copying them from both slides and make an additional diagram. Furthermore, the free slides of financial growth metaphor template provides placeholder under every stack of gold coin clip art. It enables users to add title and useful textual content against every unit of bar graph. The free PowerPoint template of finance growth metaphor aids as a framework for businesses to identify obstacles in achieving goals. The premium users of SlideModel can benefit from the three slides template of finance growth metaphor presentation.